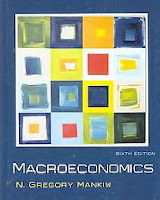 Now is the time of year when professors choose textbooks to use in their spring classes. If you are an economics professor planning to teach either a principles course or an intermediate macro course, please consider mine. Instructors can get complimentary examination copies, as well as copies of related teaching materials, from the relevant publisher. For any of the five versions of my principles text, the person to contact is Brian Joyner at Thomson (recently purchased by Cengage). His email is brian.joyner@cengage.com. If you would like a copy and are not a professor eligible for a free one, you will have to rely on the invisible hand of the market to meet your needs.